Discussion in 'Fletcher Knives' started by MajorD, Oct 24, 2017. I've been looking at these for awhile now. I called DLT Trading and pulled the trigger on a Tank. I wanted a 5" general/hard use camp style knife. These, unfortunately haven't moved from the DLT site and don't seem to get much love since their introduction. After a call to Jason and a short discussion, I grabbed one. I am very eager for this one's arrival. schmittie, Bmurray, ragnerok and 2 others like this. Congrats on your new knife! Have a Bush Operator myself, think Fletchers are highly underrated. I'd really like to pick one up, but they're scarce beasts. Not the Tank, looking for a 24/7 or something similar or a Z1 with plain-jane handles. I can't get out with it yet but here it is at home. It's very comfortable as all Fletcher Knives are. I really like the blade height for the intended purpose of this knife. 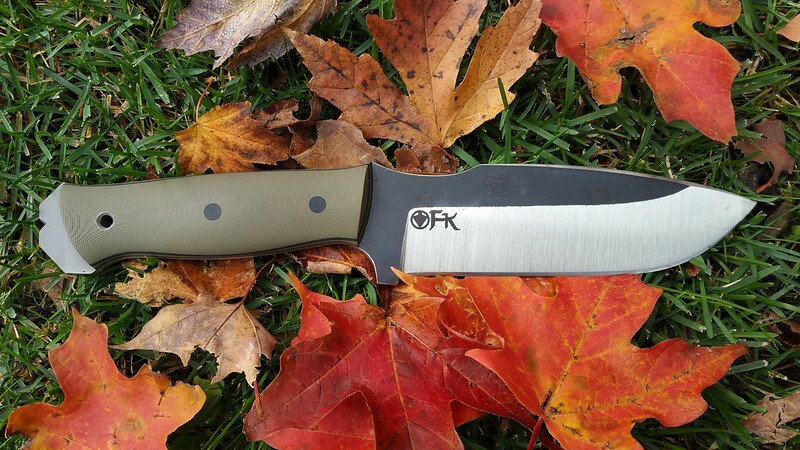 The overall size and blade height of this knife seems to neutralize the 3/16" blade thickness. I'm expecting this will perform well in outdoor applications and will also slice nicely due to these specs. The 24/7's are nice! I have one with File work and a tapered tang. It's in my EDC rotation. Dylan sure knows how to make a beefy knife, that also cuts/slices really well. By the way, I commented on your post in Knife Gods, but didn't realize it was you till just now. LOL! Hope you post more pictures after you get to use it a bit. Heber I will definitely get some additional pics posted. Things are a bit hectic currently. We also have a grand daughter due in a couple weeks so I don't have any trips planned at this time. That's a nice one. These have a lot of attributes that you find in other knives all in one package. @MajorD any update on the Tank? Unfortunately not at this time. Between hunting season and a new grand daughter arriving this week (mom and baby healthy) my schedule has been a bit busy. I probably won't be able to get out until after the holidays and that might mean spring here in Michigan but we'll see how winter goes. I did, however, try a Spec Ops brand Combat Master sheath for it and it works well. I can get some pics up soon of that. I almost always prefer leather but this sheath will work nicely for this particular model. Congrats on the new Grand Daughter!